Okinawa All Stars of Japan, qualifier of the Asia Pacific Region, won the Gold Medal against Los Mochis of Mexico 5-4 on August 14, after they beat Puerto Rico at semi-finals 11-10. This was the first victory for a team from Japan in the long history of the tournament. The six U.S. teams came one each from the North, East, South and West U.S. zones, four international teams, a team that won a host-area tournament consisting of teams from southwest Pennsylvania, eastern Ohio and northern West Virginia, and the host team, Washington. 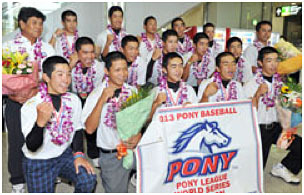 West zone winner Hilo, Hawaii, became the first Hawaiian team since 2004 to qualify. The four international teams this year were from Japan, Germany, Mexico and Puerto Rico. The most recent international team to win the tournament was Chinese Taipei in 2009. Homeruns: LM–Gerardo Quinonez, Miguel Sanchez, Guillermo Guerrero.